BETHESDA, Md. — In the final round of the 2012 AT&T National, Tiger Woods shot a final-round 69 to claim his 74th win on the PGA Tour on Sunday, July 1, at Congressional Country Club in Bethesda, Maryland. 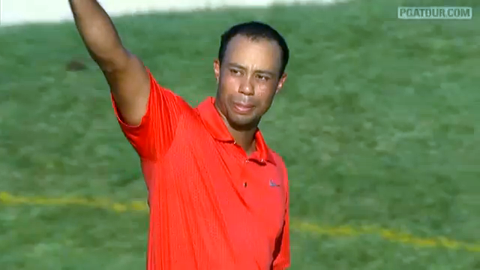 Tiger Woods wins third 2012 PGA tour win at AT&T National. Thousands of golf fans got to see Woods win his third PGA win this year, surpassing Jack Nicklaus for second on the PGA Tour’s all-time list. Woods shot a 2-under-par 69 during Sundays’s final round to become the first golfer to win three PGA Tour events in a season since Jim Furyk in 2010. Fans had been kept away from the golf course during the third round because of a storm that had knocked out power and uprooted trees, but they were able to return Sunday to see Woods defeat Bo Van Pelt for the win in a back-nine duel. This win has moved Woods to the top of the PGA Tour. This win also puts Woods in a position to reclaim No. 1 over the final two majors of the year. The ranking is based on points over two years. Van Pelt had nothing but high praise for Woods. The PGA Tour next moves to White Sulphur Springs in West Virginia for the $6.1 million Greenbrier Classic from July 5-8. It will be Woods’s final event before the British Open, the season’s third major, which is scheduled for July 19-22 at Royal Lytham & St. Annes in northwest England. PFP Sports and Celebrity Talent Agency is a speakers bureau and top booking agent for golf speakers, athlete appearances and endorsements.